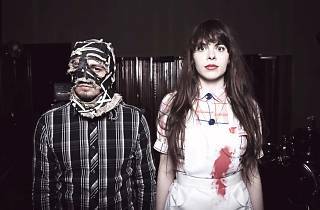 Le Butcherettes is a band created by singer and guitarist Teri Gender Bender, who found fame on the Mexican underground scene giving concerts dressed in 1950s housewife garb, complete with broom, duster and apron covered in blood as a criticism of the treatment of housewives as slaves. She also is prone to employing fake blood, flour, bones from meat and a real pig's head, and interacting with the audience. The punk/garage rock group are in Madrid with their third album, 'A Raw Youth' (2015).